Players who jumped into the game's pre-launch demo can unlock the alternate Classic Mario costume in Mario Tennis Aces. Nintendo fans and tennis enthusiasts alike have been treated to the latest sports crossover game in the form of Mario Tennis Aces for the Nintendo Switch. It's a game rounded out by a stacked roster of Nintendo characters and surprisingly deep gameplay, to say nothing of added bonuses like unlockable characters. Some players may have noticed that they've got a special alternate costume for Mario in the form of the Classic Mario skin, which is not only a cool bonus in itself, but also points to the future inclusion of alternate outfits being featured in the game. However, some players don't have the Classic Mario outfit and are wondering how to get it. Fortunately, we have the answers. As might have been guessed, there's both good news and bad news on this front. The Classic Mario outfit for Mario in Mario Tennis Aces is a free item that was available to everyone that fulfilled one specific unlock requirement: participation in the Mario Tennis Aces Online Tournament demo that released back on May 24 of this year. Unfortunately, that demo tournament has since concluded, ending in the morning hours of June 4. 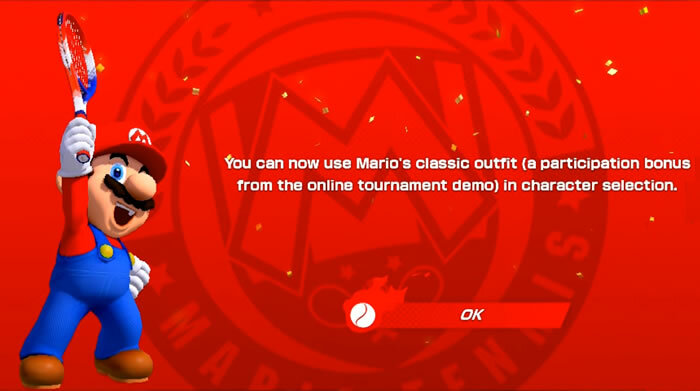 However, players who participated during that time and kept the demo's save data stored to their Switch systems would see a notification screen when launching the full version of Mario Tennis Aces stating that the classic Mario outfit had been unlocked. As far as can be told, there is no way for players who missed the opportunity to go back and unlock the classic Mario outfit. The demo itself has been pulled from the Nintendo eShop, and those who have the demo should find that they're no longer able to participate. As such, the Classic Mario outfit is a bit of a rarity, for the time being anyway. It may be that Nintendo will give players another chance to unlock the Classic Mario outfit in Mario Tennis Aces. It's Mario, after all. But for now, it seems that only those who participated in the Online Tournament demo will have unlocked the outfit.